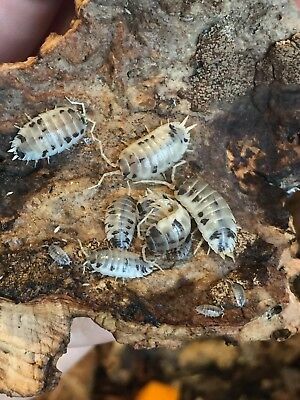 Up for auction is a starter colony of 15 mixed size "Dairy Cow" isopods, a cultivar of Porcellio laevis. A 5 gallon container or aquarium easily houses a large colony. They need a moist bedding of coconut 'core' or other moisture retaining substrate. Give them places to hide under, like cork bark and other pieces of wood. They mostly eat hardwood leaves but need supplemental feedings, such as pieces of fish food, fruits and veggies. I keep mine at room temp with no supplemental lighting (they often hide from light). Last edited by Acro; 04-08-2019 at 06:20 PM. I’m happy to see we share the same interests. I hope to see you in the future! PM me or vocispravis@gmail.com for contact to discuss payment and address for shipping when you’re ready. Yes, plants and bugs are amazing, I'm glad you like them too! Go check your PM so we can arrange shipping.